I had an appointment with the doctor today. Nothing special or newsworthy, just my annual physical the details of which, at 42 years of age, you’ll thank me for keeping to myself. While I sat in the examination room awaiting my doctor’s arrival I wandered across the room to peruse an assortment of information pamphlets in a rack on the opposing wall. 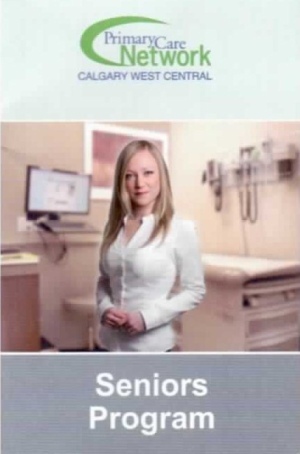 These little pamphlets provide basic information on various health related issues outside of your more urgent “Doc, my guts hurt and there’s puss coming out of my ears” type stuff. So, for example, if you have been told to quit smoking there’s a pamphlet on that that tells you what services are offered in the city and how to go about getting help beyond what your doctor can do in office. Topics range from depression to high cholesterol to nutrition to pregnancy to vaccinations and on and on. They also offer, as you can see in this example I took the liberty of scanning for you, Seniors Programs. Seniors Programs administered by attractive, young blonde women in tight tops for which there appears to be a significant risk of busting out of. I proceeded to open up the pamphlet and was immediately rewarded with this delightful young redhead whose top, unfortunately, appears to have been washed many, many, many times and is at risk of losing opacity. I find myself reevaluating my previous aversion to aging.